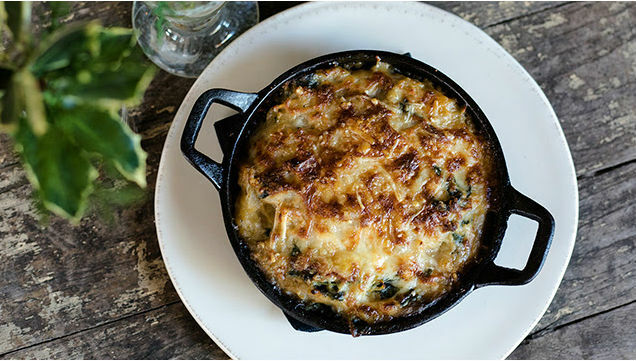 Spaghetti Squash Gratin with Cauliflower Béchamel is a farm fresh twist on comfort food. Make this dish for your family on a chilly night, or a bring this crowd-pleaser to your next holiday get-together! In a large saute pan, on medium heat add olive oil, add garlic, pepper flake, onions, butternut squash, kale and cook for about a minute, until kale softens. Place on a sheet pan and let cool. 2. Place spaghetti squash in a bowl and toss to separate strands. Season with salt and fresh ground pepper. Add kale mixture and toss together. 3. Add cauliflower bechamel and toss to incorporate together. 5. Once the mixture has been completely incorporated, separate the mixture into 4 different oven proof casserole pans. 6. Add the fontina cheese, parmesan cheese and bread crumbs to the top of the casserole dish and place on a half sheet pan. 7. Place in preheated 350 degree oven and bake until mixture is bubbling, cheese is browning and bread crumbs are brown. 8. Garnish with chopped Italian Parsley. For an entrée, this dish is paired nicely with an arugula and cherry tomato salad tossed in a Dijon red wine vinaigrette. Split spaghetti squash, scrape seeds out of half, wrap with foil and place on a sheet pan in a preheated 350 degree oven and roast until soft–about 40 minutes. Remove from oven and remove from foil and let cool before scraping spaghetti squash out of the shell. Peel butternut squash, and slice and split lengthwise. Scrape out seeds and cut into half circles about an inch thick. Then proceed to cut into 1 inch by 1 inch cubes. Put cubes into bowl and toss with olive oil, salt and fresh ground pepper. Place on parchment paper covered sheet pan and place in preheated 350 degree oven and roast until soft and turning lightly brown. Peel onions, sauté in a pan with oil, salt, pepper, rosemary sprigs. Deglaze the pan with some white wine and place in 350 degree oven and roast until caramelized. Will be golden brown and tender when pierced with a fork. To a medium size saucepan, add cauliflower florets, chopped leeks, garlic and stock. Bring contents to a rolling boil, then drop to a slow simmer. Allow to cook for 45 minutes until cauliflower florets and leeks are completely soft and cooked through. Strain the contents of the saucepan, reserving about 2 cups of the cooking liquid for later. In a food processor, blend the cooked cauliflower, leeks and garlic until a puree is formed, slowly adding some of the reserved cooking liquid until you get a creamy and slightly thick consistency. Add the grated parmesan cheese to the mix while you are blending it. The puree should be like a creamy cheese sauce.